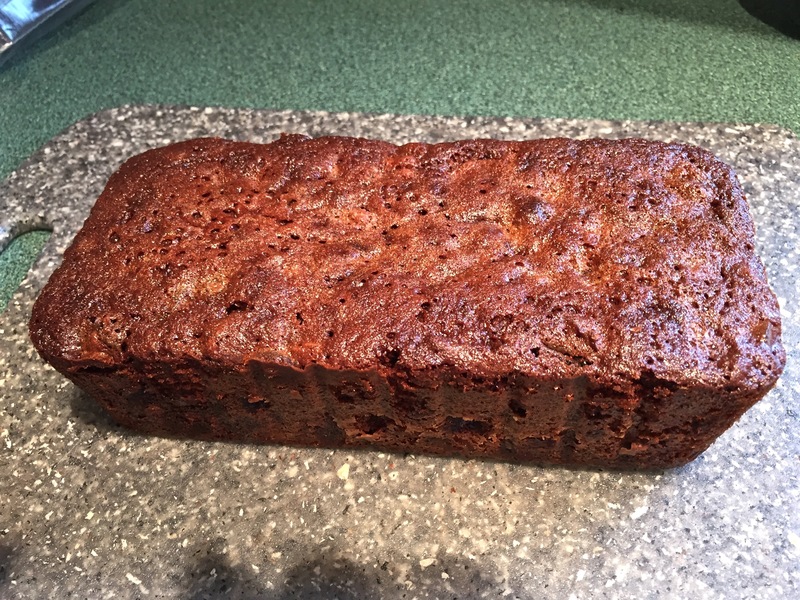 I’ve shared my Dark Fruit Cake recipe before — usually I make them around Canadian Thanksgiving which is in 10 days or so, but this year I started earlier because I’m travelling to Peru at the end of the month and November is too late for the cakes to age enough. So I started last week by adding 10 oz of dark rum to a large Tupperware bowl with a sealing lid, 2/3 full of candied fruit — by yesterday the fruit had soaked up all the rum and smelled wonderful. This afternoon I made the cakes. I’ve ended up with 5 half pound loaves, 7 one pound loaves, and 3 two pound loaves (and then I still have one two pound loaf in the fridge from 2014) — that’s more than enough for gifts this season! I have to admit I cut a very thin slice from one of the mid-sized cakes to make sure it passed quality control – lovely (even if I say so myself). They’re all now wrapped in wax paper, stored in the fridge in ziplock bags for when I will want to wrap them for Christmas giving. Soak candied fruit and raisins in rum for 3-4 days before making the cakes. Add rum to the fruit, cover bowl with plastic wrap and stir occasionally to make sure rum is absorbed by the fruit (Add the marmalade at this stage). In a second large mixing bowl, cream butter until soft. Add almond extract and vanilla and incorporate. Add sugar and cream until well blended. Add eggs one at a time beating well until incorporated into mixture. Melt chocolate [I use my microwave oven for this] and add. In a separate large bowl mix flour, baking soda, baking powder, spices. Add about half of this mixture to the candied fruit and mix well. Add remaining flower mixture to fruit and mix. Add butter and egg mixture to fruit and mix well. Place pans in middle of oven. Remove cakes from oven. Place on a rack to cool. Once they’re completely cool, remove the cakes from the pans [peel away parchment if you’ve used it]. Wrap each cake in waxed paper. Put each into a ziplock bag and refrigerate for at least a month before using. If you enjoy a tasty dark fruit cake, do try this one. I’ve been wanting to do a floral piece for a while now. 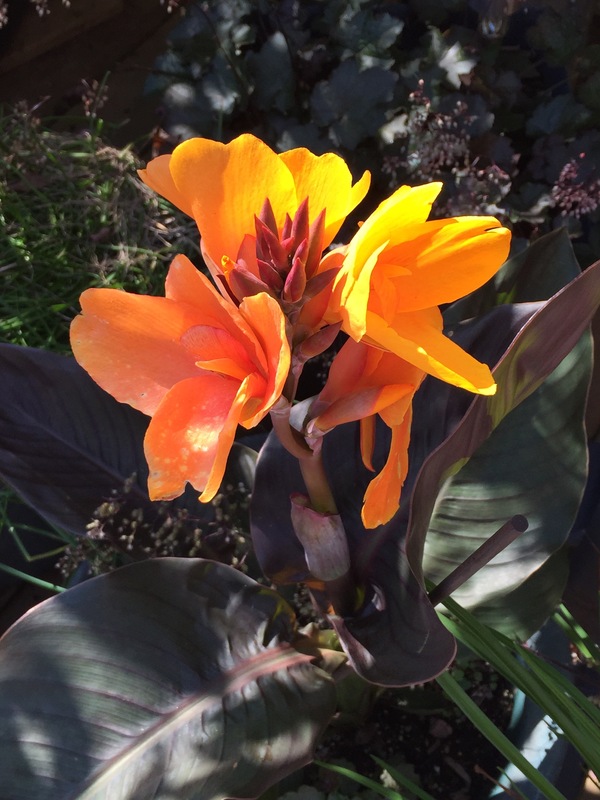 The Cana lilies on my back deck are gorgeous again this year and against a dark foliage background would be striking. 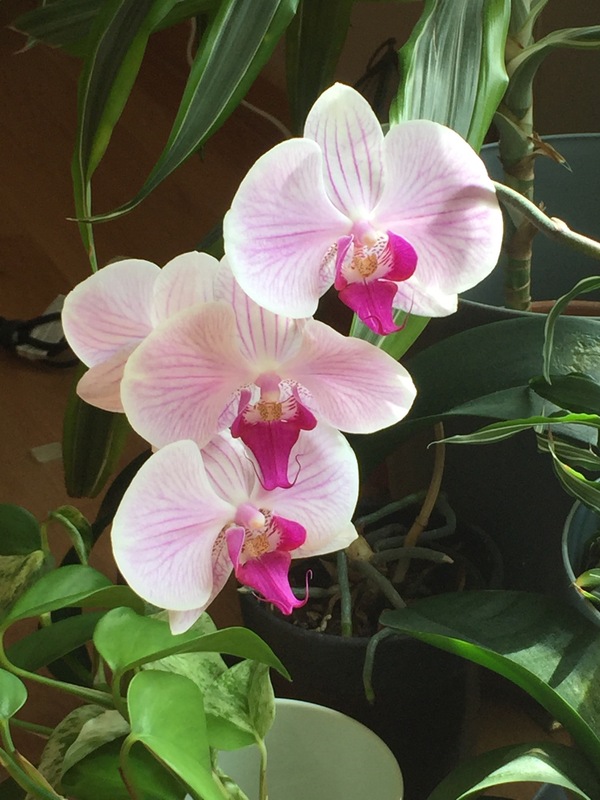 Or a rendering of a phalanopsis also against a dark background would be eye catching. And my Echineacia have been wonderful again this year (even if I can’t get them to return in the pot). 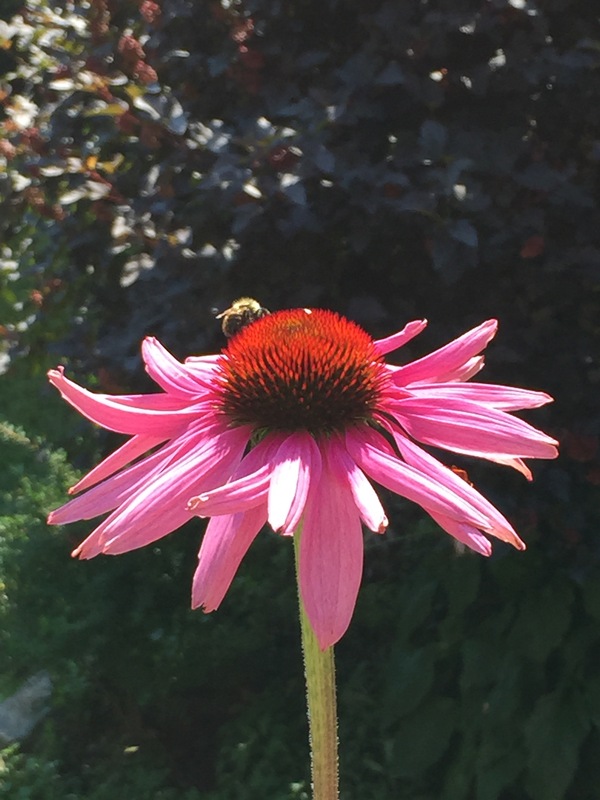 And this one has an insect visitor! 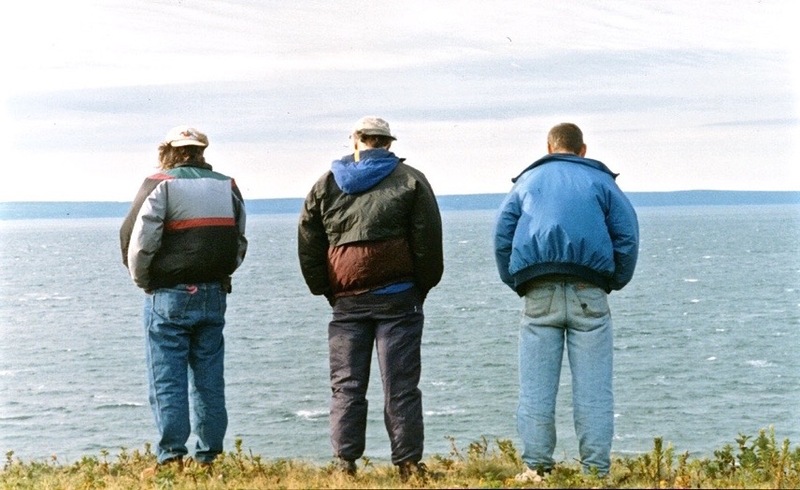 I took this photo of the three pilots “wind waiting” many years ago and it’s an art quilt asking to be made. 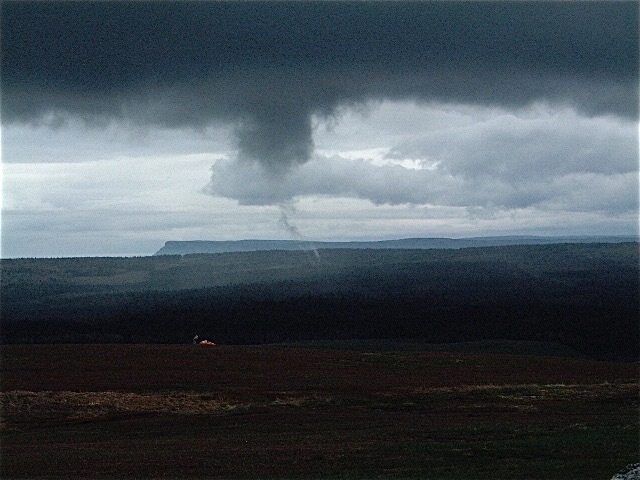 And I’ve have this dark image of the cloud funnel we saw from Kirk Hill in Parrsboro with Blomidon across the bay and the glider in a heap on the ground barely visible – it would also make an interesting piece. I have a lot of great photos that would lend themselves to textile art pieces – choising which to work on next is the challenge! Over the weekend I managed to do a lot on this art quilt – last week I had completed the piecing of the foreground, but there remained all the stitching to be done. I worked at a bit on Saturday and again on Sunday keeping in mind that “less is more”! Then I applied the narrow inner white border topped by the dark blue wide outer border – the mitres at the corners were as close to perfect as I could get them. However, as carefully as I was attempting to keep everything flat, I ended up with a bit of a buckle in the piece itself. Before taking both borders off and starting over, I decided to take the piece to the framing shop for their thoughts on how I might deal with the problem. They suggested I could stretch it on a frame which would definitely help smooth the piece out – so that’s what I’ve decided to do. When I get the piece back from the framers, I’ll add a backing and a label (by hand, of course). I can’t put an embroidered signature on the front of the work because the piecing is too dense for the close stitching of a machine embroidery (I broke two needles applying the borders at the corners) – so a label on the back it will have to be! I should have the art piece back in two weeks. Now on to something new. Another pair from leftovers. 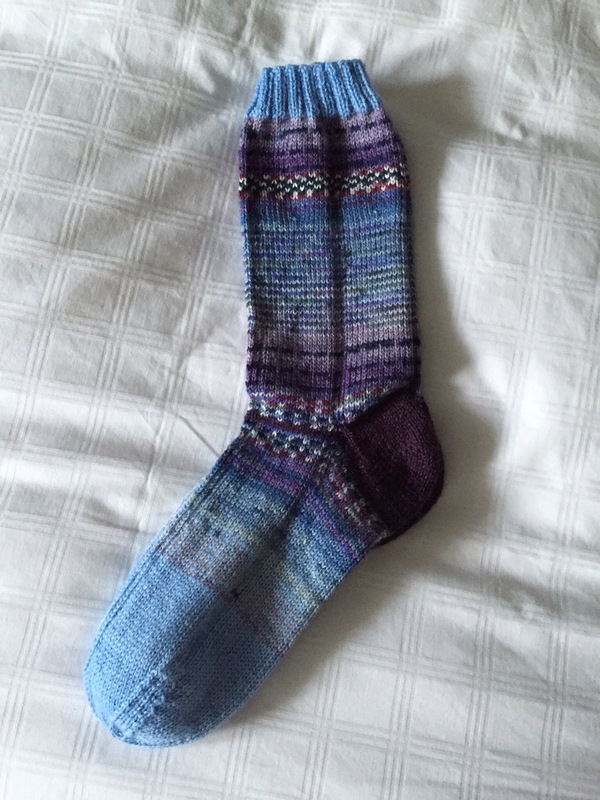 I see now the cuff should have been in the purple rather in light blue – had I done that the color would have flowed from dark to light. I could change the cuff by unraveling this one and knitting a new one from sock to edge – but really that’s more work than it’s worth! They’ve been put in my sock drawer as they are. That’s it without taking a couple of pair out! Just finished piecing the foreground for this wall art quilt. 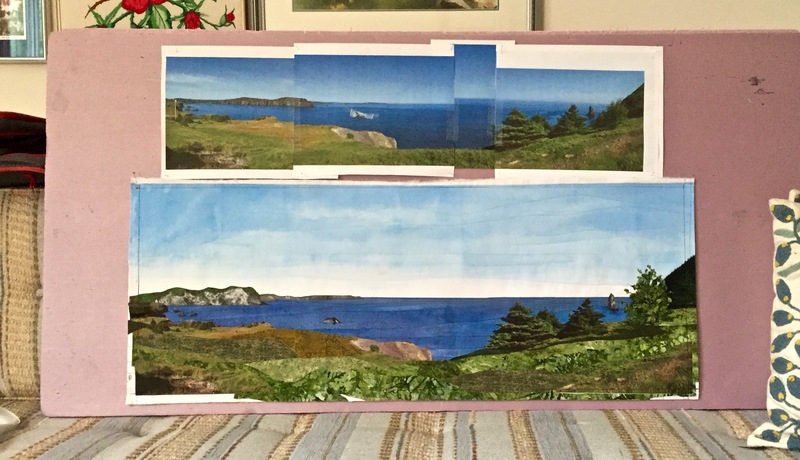 At the top you see the photographic collage built from three photos and an insertion to widen the panorama; below is the quilt. It took a lot of trial and error to establish the “layers” in the foreground – green fabrics that look like grass, shrubs, etc. is impossible to find – I’ve had to hint at the different vegetation by using various green fabrics in my stash. Once the stitching is done, the whole foreground will blend better. So next comes the stitching to make sure each piece of fabric is permanently attached, and to represent the horizontal flow of the vegetation. Once that is all done, I still have to figure out how to add piping (probably in white) as mat; and finally a wide binding (I’m thinking 2″) to frame the picture. I picked up some dark fabric a couple of weeks ago which may work well. But I think I still want to audition something else — so a trip to Atlantic Fabrics early this coming week to see if there I can’t find something better for the job. 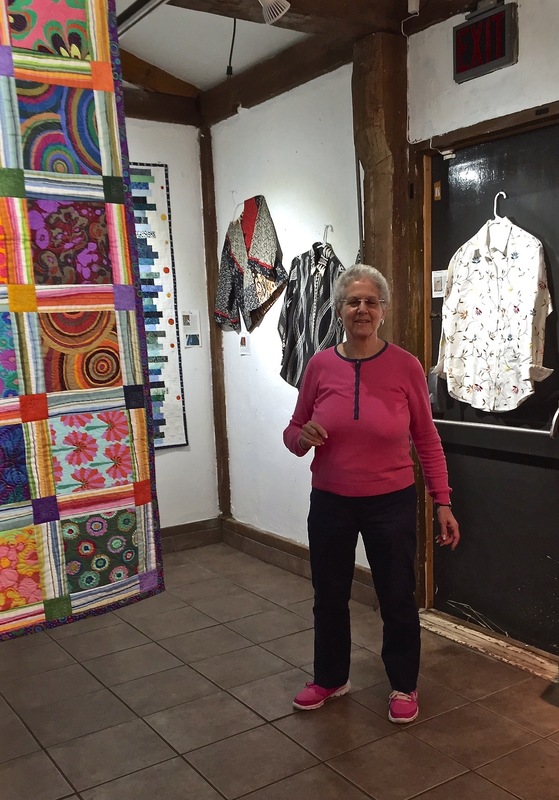 I’m having my first art show — Functional Art: Quilts & Garments. At the Art Lab and Studios in Parrsboro NS (2 hours from Halifax). 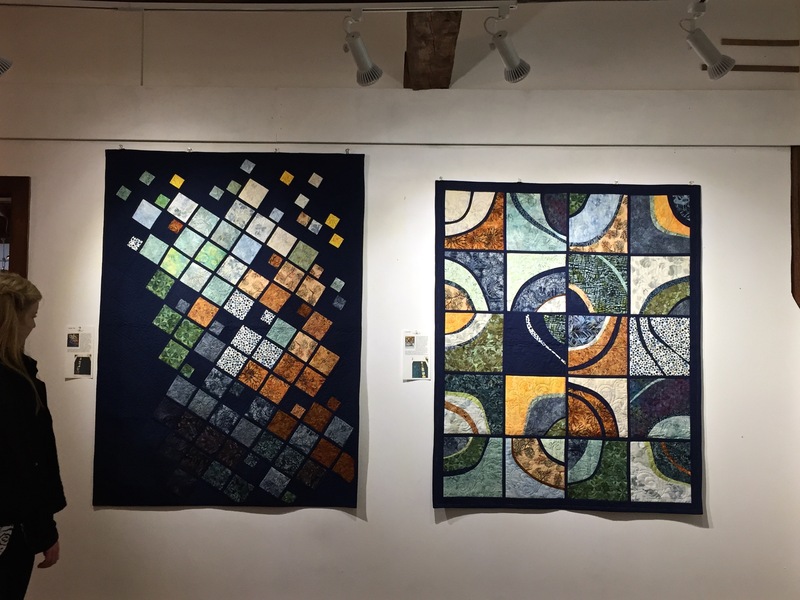 I had a difficult time deciding which quilts to put into the exhibition – in the end I chose 10 showing a range of work over three years. I also included three jackets and two shirts illustrating wearable art. 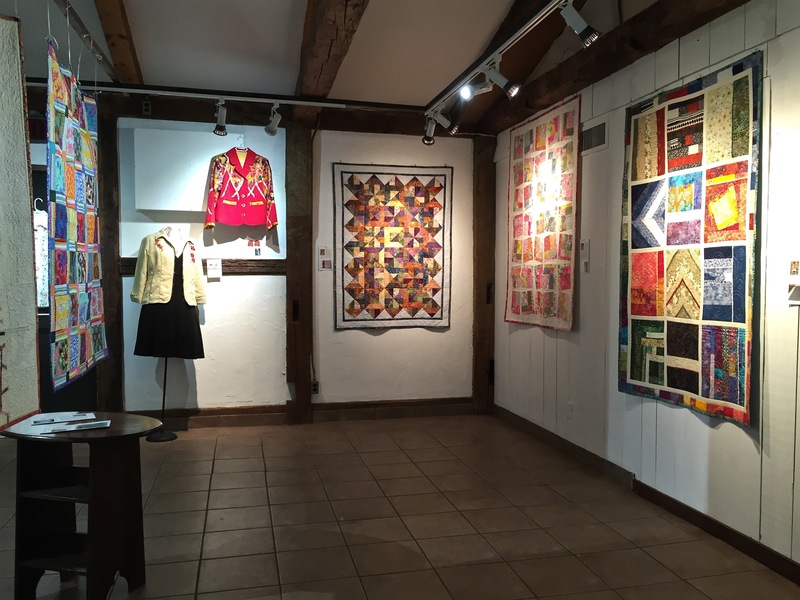 Although the gallery is small there was plenty of space to showcase the quilts and garments and the room was popping with colour when we finished hanging the works, yesterday. There’s a story behind each of the pieces. I will get to talk about that tonight when I go back for the opening. I’m looking forward to seeing reactions and hearing comments. I’ve been making my own swimsuits forever – because I can’t buy one that fits exactly the way I want it to (you know, that flat bottom with skinny legs!). 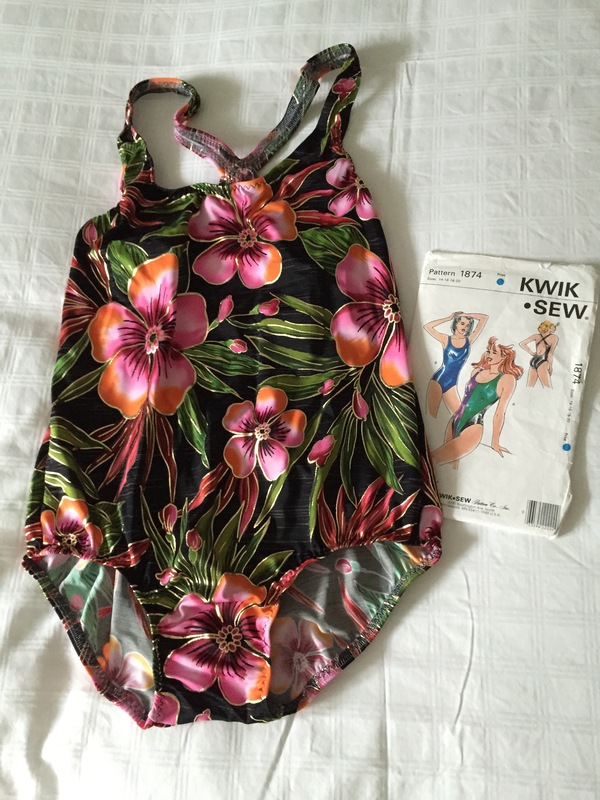 Many years ago I found this Kwik Sew pattern that produced a great swimsuit – 2 hours from start to finish. The only challenge was adding the elastic to the arm/neck and leg openings. I’ve always done it using a zigzag stitch on my embroidery machine but it’s a fiddle getting the slight amount of fullness distributed evenly. Takes quite a bit of pinning and an awkward hand position as I’m sewing the elastic in small segments. Once the elastic is in, the top stitching is no problem. 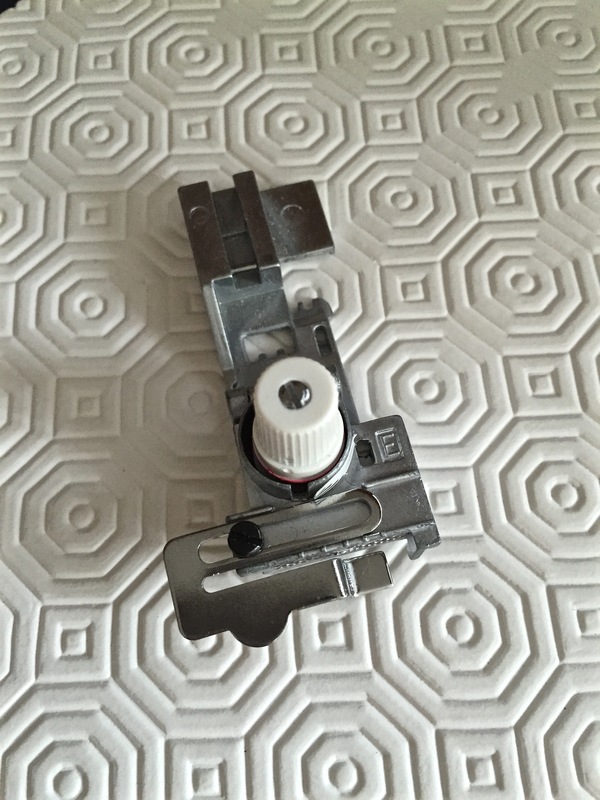 I got a new serger a couple of weeks ago (a Baby Lock Evolution) and I went for my new owner lesson. I explained to Heather, the teacher, I’ve been using sergers for more than 40 years, I didn’t need help threading the machine — what I wanted to learn was how to use the serger to apply elastic to swimsuits. I had come prepared with swimsuit fabric scraps and some elastic for us to try this out. So she found the appropriate elastic foot for my machine and we got to work. Here’s the challenge – the arm/neck opening on my swimsuit is 120″. For a comfortable suit I need 106″ of elastic so the amount of gathering is minimal, but I still need a bit of fullness to be accommodated in the elastic. There are two ways of achieving that gathering – with the differential feed and with the knob on the elastic foot itself. The instructions suggest the maximum amount of gathering with the differential foot – we tried that – way too much gathering; we adjusted the differential feed back to normal and just used the knob on the foot to adjust the tension on the elastic – it didn’t need much. When I got home I started experimenting – the ratio of fabric to elastic: 1.13 so I cut a strip of fabric 15″ long, a strip of elastic 13 3/8″ (plus 2″ for the initial feed – marking the 2″ mark with a permanent marker and positioning the elastic with that mark at the needles leaving me 13 3/8″ of elastic to be sewn to the fabric edge). My goal was to attach the elastic to the fabric edge (using the 4 thread overlock stitch) and have fabric and elastic come out about even. It turned out that I actually needed a negative differential feed setting – 0.8 seemed to work well and very little tension on the foot knob. It took several tries to find the amount of gathering I was after but I thought I was close enough so I decided to try a swimsuit I had cut out and partially assembled. My usual way of sewing up a swimsuit is to sew the side seams, the center back seam, the should seams and the crotch. To apply elastic with the serger I needed to leave the back center seam and the crotch seams open so I could work with the openings as flat fabric. The first swimsuit I worked on required a LOT of patience — I stitched the elastic into the neckline but the fabric gathered too much; I removed it, all 106″ of it, and tried again. Second try I didn’t have enough tension on the elastic itself and so I ran out before I got to the end of the fabric; again, I removed the elastic, readjusted the tension on the elastic foot and tried a third time. It actually took a fourth try to get the tension more or less right but in the end it worked. The leg openings required a wee bit more tension — the first leg opening turned out nicely on the first try but the second was way too gathered. I ripped the stitching out and tried a second time — it was better (good enough to live with). I serged the center back seam and the crotch, then turned the elastic and top stitched it in place — voilà I had a wearable swimsuit (I wore my new suit to aquafit class yesterday and a couple of gals commented favourably on it). Having finished one swimsuit successfully I cut out a second and sewed it up. This time the elastic in the arm/neck opening went well on the first try, as did the leg openings. Serging the center back seam presented a bit of difficulty because I had to start the stitching on a double thickness of elastic (on my next swimsuit I will use a starter strip of double thickness of fabric to get the seam going) but a second try was successful. Again, I sewed up the center back seam, the crotch, turned and topstitched the elastic and swimsuit #2 was done! What a difference this foot has made to the process of swimsuit construction – the elastic is easily applied and the whole production from cutting out the fabric to finishing the sewing took about two hours. The elastic foot was definitely a good investment!